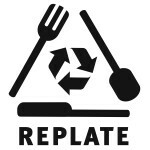 v. (re*plate) : to place unwanted leftovers, typically in a doggie bag, on top of the nearest trash can so they don’t go to waste. Instead of trashing your leftover goodies, place your leftover Chicken McNuggets, Fries, KungPao Chicken, PadThai, half eaten burrito, you get the picture, on TOP of a public wastebasket in a pedestrian area. Think again before you trash your takeout box, brown bag, foil wrapped treasure of half eaten good eats.